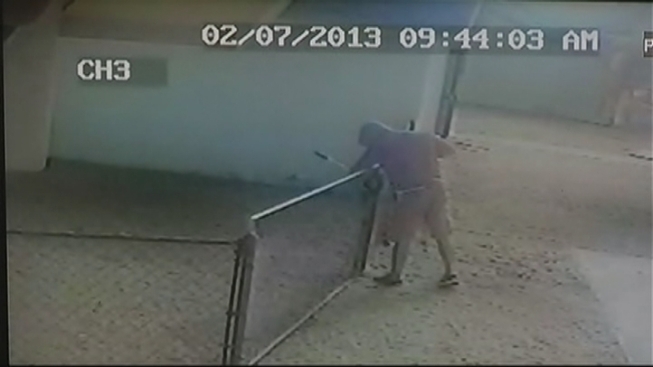 Surveillance cameras were rolling outside the Cutler Bay home of Yasmany Beitra Thursday morning. They caught a purple-hoodie wearing thief make off with Beitra's $14,000 jet ski. Beitra's hoping his crystal-clear video will help nab the thief, who's seen on camera knocking on his front door. "It has a lock on the jet ski, it has a lock on the door," Beitra explained. "I have security cameras, you know, it's like going into a bank." From start to finish, the robbery takes place in about five minutes, starting at about 9:42 a.m., when cameras capture the suspect's face as he knocked on the front door of the home on the 12,000 block of Southwest 211th Street. With no answer, the plan moves forward. The thief heads to a waiting white pickup, and grabs a pair of shears before trying to snap open the chains and lock of the fence where the jet ski was kept. His shears weren't strong enough, so he left and came back with new shears, and began cutting open the fence, the video shows. The man was seen on National Armory's surveillance cameras pocketing four expensive tactical knives. 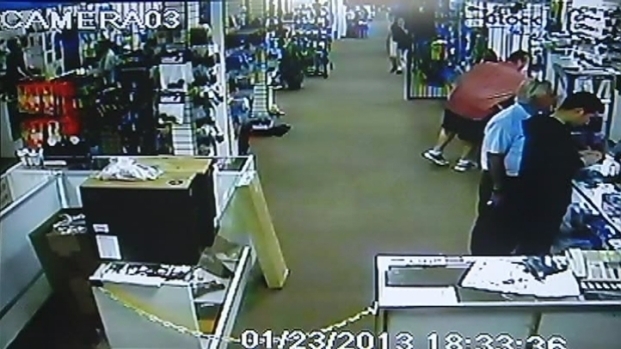 In the footage seen here, he reaches for a knife with customers nearby. Minutes later, he made his way inside, past a more expensive boat and around back to the jet ski. By 9:55 a.m., the thief had hitched the boat to the back of the white pickup and rode away. Beitra's sister heard the commotion, and raced outside from her nearby home, but she was too late. "When she came out, they were pulling out the driveway, so she called me and told me they just stole the jet ski, so I came over," Beitra said. Beitra said he is happy his wife and 9-month-old daughter were not home. His major concern now, he said, is paying off the an uninsured jet ski, which he may never get to use. "So I still have to pay it off, even though that it's stolen now," he said. Beitra said Miami-Dade Police are investigating his case.